I'm feeling a little bit lucky and a little bit appreciated by other members of the bloggy world, and have been nominated for another Liebster award! (Here's the link to my previous one). The lovely Anna at Bombarded Mum nominated me - thanks Anna. So flattered because your blog is simply brilliant! 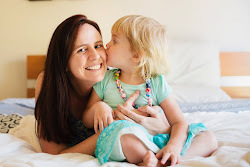 I'm hoping that later this month you'll have to chance to get to know Anna a little better - she really has an amazing blog full of parenting advice. What is your blog/business & where can we find you? Teacher Types is where I share many 'Early Leaning' advice and activities I do with my toddler and school students. What inspired you to blog in the first place? I was returning to work part time, and felt that I needed something more, a productive hobby to pass the time while my little one slept - to avoid watching too many hours of TV. I love how it combines all of my interests in the one place. And the virtual friendliness that you come across all the time is just lovely (like the whole theory of the Liebster award). Share the love! How do you fit blogging into your day/week? On work days I sometimes blog in the evening when Miss M has gone to bed, and on days off, I'll usually do a bit when she has her afternoon sleep. I know you are a mum and my readers are also mums so let’s talk about being an awesome mum! I have one daughter. Little Miss M who is almost 2. What is your proudest moment as a mum (you can add a few)? Seeing how clever she is everyday! Her language and how much she remembers amazes me. She's always been a little clingy one - so when she does start to come out of her shell whether it be with family members or child care staff, I feel really proud that she's making progress. What are your biggest challenges as a parent? What is your favourite kid free time activity and how often do you get to do it? Blogging! Well, apart from that, hubby and I love date night. Going out for an awesome dinner. We try once a month but this depends on babysitters. Who is your inspiration to be such an awesome mum? I found this questions really tricky to answer. I really look up to my mother-in-law, I think she's amazing. And I have this friend, who's little girl is only a bit younger than mine - she does amazing activities with her and always has great parenting advice. What is the best advice you have ever received as a mum? I wish I could find the article I read! It was a whole article about how all of the parenting advice out there contradicts itself (e.g. breastfeeding is best / but fill their tummies with formula so they sleep, let them self settle / never let them cry etc). It made me realise that I really just needed to take it all with a grain of salt and do what felt right for our baby. Wait a minute - I found it! (here) If you're a new mum READ IT! READ IT NOW! What advice would you give to a first time mum? And also - it does get better. Every stage is easier in some ways, yet more challenging in others. You'll get over one hurdle, catch your breath and then another one will pop up! If a mum is reading this and has a burning desire to start a blog, what advice would you give her? Thanks again Anna for nominating me. It's all busy in my world at the moment, back to school, Miss M is almost two so we are preparing for her birthday party. But the blog is still going strong in 2015!